Serbia: Stadiums hide mass graves? Writer and scientist Dušan Kovačević recently revealed in an interview that Stadion Partizan may be built atop a mass grave left after executions by communists shortly after World War II. That statement rocked the Serbian football community with Partizan officials reacting rather angrily to such claims. The stadium itself has been built in late 1940s, which makes the claims, based on witness testimonies, at least probable. Executions were said to take place at Humska street, where the stadiums stands now. The revelations come from the national Institute of Contemporary History and are feared to have a far more disturbing scale than just the Partizan stadium. Such fears are raised by the national Commission for identifying mass graves. 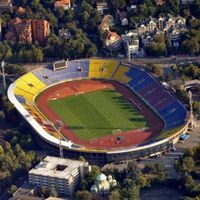 Stadia across Serbia were often built in the post-war period and in some cases may have been used to cover up large-scale executions of political enemies. Another trace leads to Stadion Borca in Cacak, currently undergoing major redevelopment. Shells from pistols used by communists at that time were found on site. And while this is no solid evidence of murder, the case should be investigated further.